Seminar and roundtable on artistic practice, educational processes, and social space. 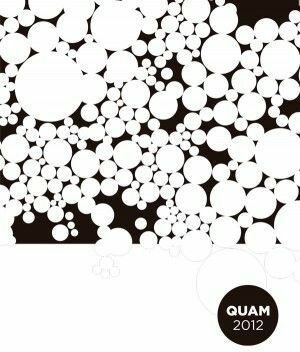 This edition of QUAM aims to advance the analysis and discussion of projects which connect contemporary artistic practices, educational practices and their impact on the social context. This is not the first time that Acvic has approached this subject, in fact in its three years of activity has focused its work on the connections between artistic practices, educational processes and their relationship with public space, promoting various projects under these guiding principles. In October 2009, an initial international seminar, entitled Reversible Actions, grouped together a number of artists, educators and cultural producers with projects in the European context. 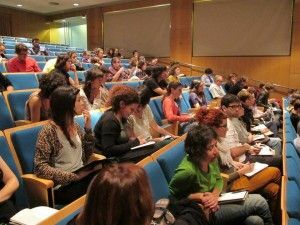 After three years, we propose a new meeting, aware that in the Spanish context, these issues have multiplied both through active proposals and an increasing number of forums of discussion, which mostly attempt to find and propose alternative systems and programmes to the traditional models. By now most art centres and museums show a greater interest in educational activities, as well as an awareness that educating their audiences may increase cultural demand and participation in culture, which still remains poor. 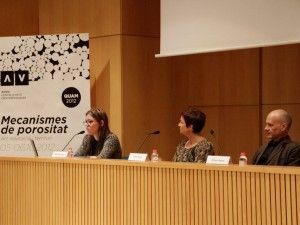 The departments of educational and cultural activities have strengthened their position as an important part of cultural planning, as well as a way of establishing a connection with their social context . These departments can stimulate an interactive circulation between cultural centres and members of the public who, under normal circumstances, would not bother to keep up a steady relationship with the arts. But recent years have seen a continuing scenario of the deepest cuts in social, educational and cultural resources, implemented by public administrations as a response to mitigate the crisis. We could say that we are in an ebb and flow effect. On the one hand, a flow which triggered new experiments by institutions or art projects, promoting new interactions and a growing momentum to bring art and education together, and on the other hand an intense ebbing away due to dwindling resources, even though this is likely to entail serious consequences which will impact in the medium and long term. The flow is the result of investment, research, experience or interest in managing new processes, and generates knowledge, expansion, interaction and new scenarios . The ebb is the result of confusion, lack of resources, austere policies conditioned under pressure by financial markets, disorientation in the search for solutions, and it creates confusion, loss of cultural programmes, the lack of consolidation of past achievements, and pubic services without content and human capital. Some of the interventions introduce us to this real context, to discuss possible strategies to address them or to promote new scenarios from previous processes. The term 'arts' from the educational standpoint often refers to two distinct areas. On one hand arts education, as much as training in the artistic field (of the disciplines and techniques which form part of the arts), and on the other hand, artistic pedagogy used as a strategy, as a tool for mediation, as a stimulus forcing linkages with other areas of knowledge, and so acting as a stimulus on learning and entrepreneurship. Technologies, design, audiovisual communication form part of contemporary arts practices, but also criticism, social, political and economic issues, innovation, strategy, time and land, among other elements, are associated with these practices. The objective of this seminar is not to analyse the curriculum of arts education, but to learn about methodologies or connections offered by the link-art education, a fertile relationship and the expanded perspective of both. In fact arts and education from this expanded perspective, become less of a discipline, and more of an 'Indiscipline' escaping from the regimented and the regulated, trying to achieve hybridisation and transforming alternatives within each specific area, the educational and the artistic. The importance of the visual (audio-visual) within the contemporary context is clear and in fact constitutes one of the ways of education and social contact which all ages, children, youth and adults, are learning to manage with increasing fluency and interest. Audiovisual technologies are attractive, they make dissemination and broadcast easier, they allow access to knowledge while at the same time entangling the participant in a labyrinth of infinite connections. Imaging technologies have evolved rapidly towards democratisation and widespread use within the overall context of communication. Current technologies have changed the fields of production, distribution and consumption of texts, images, sounds, computer graphics and data. The receiver is also the broadcaster, and so becomes a message producer. There has also been a revolution in education, since knowledge is permanently accessible, requiring mechanisms and strategies to relate, share and use this knowledge with specific objectives or purposes. Understanding that contemporary art practices draw clear bridges with these technologies for knowledge and production, it is pertinent to set out a technical or “hand-made” initial approach towards the relationship between art and education, and to set out in parallel a contiguous relationship between content creation, the establishment of objectives, and the working dynamics of sharing. Some practices bringing together art and education were formalised using the model of artists in residence at schools. A model which may be resolved in many ways, and which may provide multiple results. One way in which the model may be resolve is as follows; when the artist uses the medium to build a piece in which students are helpers and apprentices in the process. Representing the opposite pole might be experiences connected to the curriculum and shared among teachers. The resident artist and the project itself is diluted by context, where students and teachers become partners in a shared project. Between these two poles, there are many shades. Artistic practices inserted into the educational context might involve a kind of open source device, provided they are based on sharing results and processes, and where the achievements of a group or an individual, are starting points for other groups or individuals. A chain of elements blending together creativity, skills and material, produced and consumed from shared experience. A productive experience based on the self-management of knowledge and its applications. The binomial art-education acquires a multiplier effect if we insert it within a specific social context. That is, when we focus upon a place. There are a number of practices which bring together the fields of arts, education and action in social space. Such practices have been incorporated within institutional spaces, both artistic and educational. Relations and negotiations between them can respond to the need to expand the boundaries of the institutional spaces and their desire to connect with the social context. If the objective is to introduce new dynamics, the relationship between art institution and educational institution must be forged beginning with the fields of research, production and debate, and not just beginning with the exhibition. When promoting projects connecting the artistic and educational spheres, both the objectives of each area, and the commons, must be taken into account. Different rhythms, different processes, different results may, at any given moment, synthesise, conceptualise and formalise experiences associated with both. Ways of doing, which multiply when they interact. 16.00 h - 18.00 h Open Forum. Project and pappers selected from the open call (. 18.15 h - 19.30 h Round table with the participants of the day. This is not a classroom. Research project developed from evidence that pedagogical processes in higher education are a pretence of teaching and learning (in which no one actually teaches or learns anything). As a result of this evidence, in the course of this project it is proposed to use contemporary art as an educational tool, with the aim of converting this pretence into a transformative experience. The project's members have hybridised the programme for the course Bases Didácticas de la Educación Artística ( Educational bases for teaching arts) with visual semiotics, sociology, art history, relational art, performance and photography (in the content, in the methodology and in the systems of evaluation), by means of permeable mechanisms which allow for education/pedagogy to be understood as a contemporary arts practice, and contemporary art to be understood as an educational practice. - María Acaso is a teacher, researcher and writer, interested in putting into practice the paradigm shift required by education in general and arts education in particular, a change which she terms rEDUvolution. Among her works, she has published a number of notable texts, such as La educación artística no son manualidades and El aprendizaje de lo inesperado (both in Catarata) or Una educación sin cuerpo y sin órganos (Akal). She has also participated in lectures for various institutions such as The New School for Social Research (NY) and the Bergen National Academy of The Arts (Norway), as well as directing several research projects. Creative strategies in an indexed reality threshold . Teaching strategies designed to foster creativity have used fiction to generate necessary tensions between theory and reality. Is this model still valid, when contemporary technocultural devices have overtaken visible reality, and are creating indications of pre-emergent phenomena? How can we make proposals for the future in a present of indexed reality? (The term indexed reality, coined by this research group, refers to that reality which is defined not by what it is in itself, but by what points to. - Elena Bartolomé, Doctor in Fine Arts, and teacher in Design Studies at Eina. Her main area of ​​interest is the study of the processes of creating meaning through multimodal media. - Tania Costa, Doctor in FIne Arts, Teacher and member of the Visual Arts Workshop in Design Studies at EIna School . Her main field of study is artistic and design practices which affect social space, ensuring critical elements, innovation or improvements in community dynamics. - Octavi Rofes, anthropologist, teaching courses in Arts, Society and Design, and Design of Identity Elements in the Design Studies curriculum at EIna School. He has performed an ethnographic research on local cultural production, and currently is interested in creative process analysis in social networks . Las Lindes. Action and research project on education, arts and cultural practices promoted by CA2M T Centro de Arte Dos de mayo. Starting from an interest in the relationship between critical pedagogies and cultural practices, it held open meetings to work upon texts, to share and to analyse educational projects related to contemporary art practices, to broadcast experimental materials for use as teaching resources in different areas of education, and to debate related issues. The project takes as a point of departure an understanding of education as a cultural and a social project, and which is therefore also a collective project, pointing towards an imaginable, and as yet unresolved, future. - Victoria Gil-Delgado. She is an educator in the CA2M since its opening in 2008, and is an independent curator. In CA2M she has developed several educational activities, especially those related to the human body in secondary education, performance and family programmes. 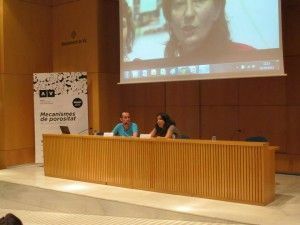 She has curated, among others, the exhibitions "Como diría Roland Barthes ni te cases ni te embarques" at La Casa Encendida (Madrid) and "Qué hace alguien como tú en un sitio como este" in La Regenta (Las Palmas de Gran Canaria), both with Beatriz Alonso. - Diego del Pozo. Artist, member of C.A.S.I.T.A. Collective and teacher of Fine Arts at Facultad de Bellas Artes en la Universidad de Salamanca. He has participated in numerous group shows. HIs work can be seen in collections such as MUSAC de León; Domus Artium 2002 de Salamanca (DA2); Junta de Castilla y León. 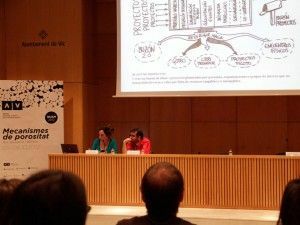 Member of Subtramas, research group on pedagogy and collective image production, together with Montse Romani and Virginia Villaplana. Why we do what we do? Notes on arts education in the era of bailouts. Education not only must adapt to social changes, but must also encourage them and guide them. Today, the challenge of arts education is to find ways of thinking apart from simplistic formulae which, beyond contributing to the media landscape and the collective imagination, may act upon political circumstances. - Arturo / fito Rodríguez Bornaetxea Professor at the Facultad de Bellas Artes de la Universidad del País Vasco EHU / UPV. Member of “Fundación Rodríguez” between 1994 and 2012 and member of Asamblea Amarika, at Vitoria-Gasteiz. He is an exhibition curator, writes in specialised media and organises art and cultural projects. The school against the dictatorship of the present. Is the end in sight for the school as a space for learning and knowledge, seeking social equilibrium? Is education to become just another commodity? Can we talk about educational practice as artistic process? Can we understand artistic practices as a font of resources applied to the pedagogical field? This project faces these issues from a more general perspective on the role of the school in relation to current policies and social reality, towards a more specific proposal through projects to relocate artistic practices in the field of knowledge and in the context of education. - Montserrat Cortadellas is a teacher and an artist. She teaches at the ICE de la Universitat Rovira i Virgili, and has been working since 1993 as counsellor and visual arts educator in primary schools. 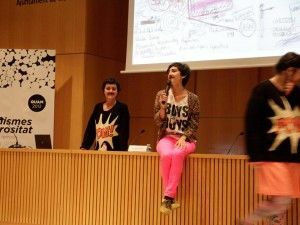 As an artist she has worked since 1991 in Estrategies del Coneixement, an arts and education project with several collectives, mainly unrelated to contemporary arts. With Marta Ricart, she initiated CultuRant Project in 2011. Educación y acción cultural. Education and Cultural Action. Overview of the lines of work developed during work realised in the Department of Education and Cultural Action at the MUSAC between 2005 and 2010, based upon the relationship between territory, mediation and production through artistic and educational activities. From this experience, an analysis of, and reflection upon, current emergencies marked by economic, political and temporary determinants affecting cultural institutions and the projects they promote, is proposed. How to maintain some consistency and how to make sense of the proposed mediation and public inclusion, considering the current structural , human and economic deficiencies? - Belén Sola has a Bachelor's degree in Art HIstory, a Master in Architectural Restoration and is a specialist in Teaching Cultural Heritage. Diploma in Estudios avanzados sobre Arte y feminismos en Latinoamérica, Universidad de León. In 2003 she created, directed and coordinated MUSAC's Departamento de Educación y Acción Cultural. Her works links to contemporary arts, defined as a mixed educational practice, investigating the relationships between creativity, education, and social transformation. Co-author and publisher of "Experiencias de aprendizaje con el arte actual en las políticas de la diversidad". MUSAC. 2010. Opening Up Prototypes. To what extent can the historical archive of a cultural institution become a tool for the development of collaborative projects? In which measure can research and reflection on cultural production trigger new relational scenarios between museums and society? OPEN SOURCE PROTOTYPES is an open source research networked programme promoted by Fundació Antoni Tapies based on test responses to these questions, through the creation of a meeting space for different groups, organisations and educational centres, and to develop projects of research and intervention around contemporary art practices. The project is under development within the Combined Arts area and has the support of various associated groups. - Oriol Fontdevila is curator and art critic. Member of the management group of the Sala de Arte Joven de la Generalitat de Cataluña. He is currently working in the projects Open source prototypes at Fundació Antoni Tàpies and De cómo convertir un museo en arena, at Museo Joan Abelló. He coordinates the programme Study 2012-2013 in A * desk Instituto Independiente de Crítica y Arte Contemporáneo. He collaborates with different publications and university master programmes. - Laurence Rassel is the director of Fundación Antoni Tàpies. Former member of Constant, an organisation based in Brussels, which investigates issues based upon feminist thought and artistic practice, as well as a work of critical analysis about intellectual property in the field of new technologies. Between 2001 and 2006 Rassel was project coordinator for ADA, a Belgian network of education centres for women promoting the learning of new technologies as a tool for integration. - Linda Valdés has, since 2008, been responsible for the web-site and audiovisuals at Fundación Antoni Tàpies, Barcelona. Former team member of the Artes combinatorias project and the Prototipos en código abierto network at the Fundació Antoni Tapies. 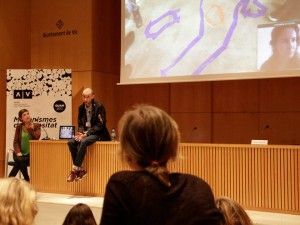 Currently a member of Equipo-re, a cross-territorial, collaborative vehicle for action and research, built around the interests of its participants in joining together art-space with critical action. Proxectoterra. This is a cooperative project of the Colegio Oficial de Arquitectos de Galicia (Association of Architects) and the world of secondary education through the Department of Education of the Government of Galicia, aiming to help improve the education of students on the subjects of territorial identity and architecture in Galicia. It constitutes a meeting point for learning how the Galician landscape has been constructed, while encouraging critical reflection on the heritage of construction, inherited tradition, architectural practices, or urbanisation of territory which should be avoided. During the course of this proposal, one thousand teachers have participated over twelve years in training and development activities. Its educational materials are accessible to all local authority schools, and most of the grant-aided private schools in Galicia. 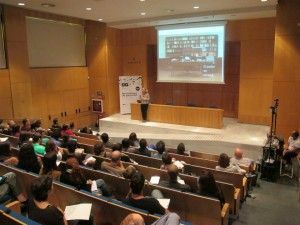 Its programming has transcended the world of education to a wider audience, with the development of "Xentes, espazos e lugares', a multimedia proposal with Xornal de Galicia, and a lectures season at the MARCO in Vigo. - José Luis González is a Primary Education teacher and currently coordinates the infants' and primary groups collaborating with Proxectoterra. He has been awarded the Premio de Innovación Educativa (Educational Innovation Prize) by la Xunta de Galicia, coordinates the education programme at Ayuntamiento de A Coruña, is director and lecturer at teacher training courses, co-author of books such as “La Pedagogía de Valores en Galicia”, “Espacios para la Infancia y la Juventud”, “Escuela y Diversidad” and contributes to educational magazines in Galicia and Spain. ColaBoraBora is an island between the prevailing reality and the projected desire, in which different types of actions and processes occur to generate other forms of relationship, organisation, production and consumption around the common, the free and the open. A paradise in a process of exploration, oriented around four cardinal points: the commons, open source, collaborative practices and social entrepreneurship. An ico-system populated by an emergent, heterogeneous, inclusive and mutant community, meeting around socially transformative initiatives, from the everyday, the small, the nearby and the emotional. A space for meeting and facilitation, a citizens' laboratory of reflection in action from which to ask questions which may seem new, but which remain the same questions as always: How can we prepare ourselves to produce and to create common value as equals? How could we demand a government of equals, and become capable of self management? How can we live together in community in a sustainable and co-responsible way? AMASTÉ is an office of ideas specialising in bringing together processes and devices of mediation which stimulate imagination, and promote active reflection, critical thinking and citizen empowerment. A laboratory of collaborative, relational, participatory, experimental, and transformative projects of public utility and in connection with the context. + Projects and proposals selected by open call. This activity is part of Pla de Formació Permanent del Departament d'Ensenyament de la Generalitat de Catalunya. > FORUM QUAM 2012. Form access registration. 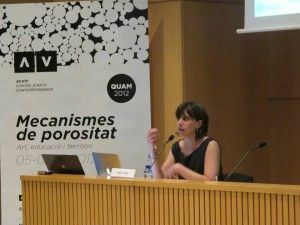 M. Carme Bernal, Professor of the Teaching of Literature at Universitat de Vic. Maite Palomo, Coordinator at ACVic Centre d'Arts Contemporànies. Ramon Parramon, Director of ACVic Centre d'Arts Contemporànies and IDENSITAT. 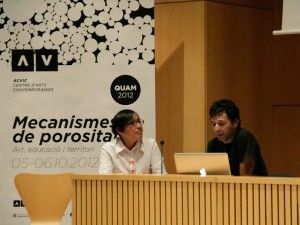 Octavi Rofes, anthropologist and professor of Art, Design and Society at EINA, affiliated with Universidad Autónoma de Barcelona. QUAM is an initiative which from the start has been attentive to the needs generated by contemporary art throughout the years. From its beginning, and through different approaches, the workshops and lectures of the QUAM have been oriented towards the complete training of new creators and critics. 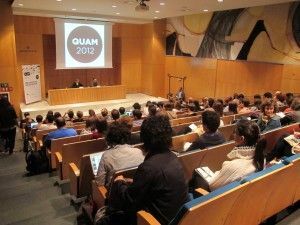 Initiated in 1988, QUAM is one of the longest-running arts meetings in Spain, consisting of a summer university of the visual arts based upon open meetings with prestigious artists and cultural professionals, upon whose participation we can rely, as we have relied in past years. Since H.Associació per les Arts Contemporànies assumed the organization and management of QUAM in 1992 , has always attempted to answer the needs of the moment. This justifies the changes of orientation and format in different stages, which foremost have tried to delineate possible futures. Currently QUAM will be part of the Centre d'Arts ACVic, managed by H. Associació per les Arts Contemporànies. ACVic defines itself as a centre focusing on the relationship among educational actions, territory issues and social interaction. Artistic practice is understood as a practice that affects, interacts with and transforms social space. Art combined with education can generate production spaces, open to experimentation. 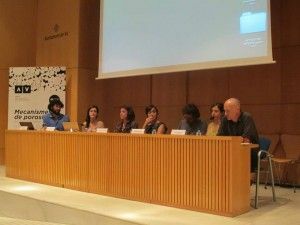 QUAM 2012 is a programme by ACVic Centre for Contemporary Arts in collaboration with UVic Universitat de Vic, Escola d’Art i Superior de Disseny de Vic and VIT Vic Integració Tecnològica and the collaboration of Aula al Pati, project of Lo Pati. Centre d'Art Terres de l'Ebre. With the collaboration of the Associació de Professionals de la Gestió Cultural de Catalunya. 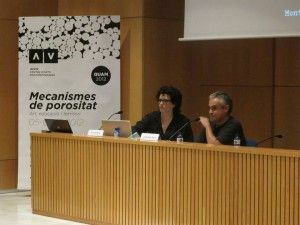 ACVic is the result of a collaboration among the Ajuntament de Vic, Departament de Cultura of the Generalitat de Catalunya and H. Associació per a les Arts Contemporànies.